RBTH presents a selection of views from leading Russian media on international events, featuring analysis of why the transit of Russian gas through Ukraine is likely to continue well beyond 2019, as well as a preview of the upcoming meeting between the Indian and Pakistani leaders at the SCO summit in Ufa as both countries prepare to join the organization, and a report on the latest developments in the Greek debt crisis. The Gazeta.ru online newspaper writes that Russian gas has no alternative to transit through Ukraine for the next few years. 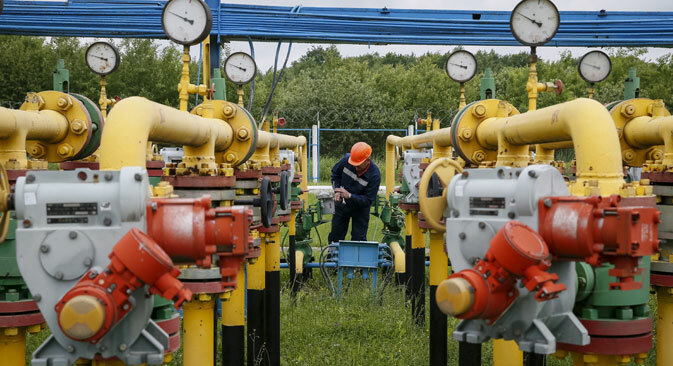 Ukrainian President Petro Poroshenko announced on July 7 that the transit of Russian gas through Ukrainian territory will continue after 2019, when the contract expires. Gazprom continues to say that Kiev's conditions are unacceptable: Ukraine is trying to change the conditions of the transit contract, raising the tariff rate from the current $2.7 per 1,000 cubic meters for 100 kilometers to $5. Gazeta.ru reminds its readers that the main alternative to the Ukraine transit route is Turkish Stream, the project to pipe Russian gas under the Black Sea to a distribution hub in Turkey. But for now the project is still up in the air. Turkey has so far only given permission for engineering exploration and is threatening arbitration unless Russia does not decide on a discount for Turkey in the near future. The publication reports that Gazprom has another project: a pipeline with a 55-billion-cubic meter capacity that would be laid along the seabed of the Baltic Sea, parallel to the existing Nord Stream pipeline linking Russia with Germany. But here there are also complications: It is not clear what the situation will be concerning aboveground infrastructure. "You can't argue with the fact that transit through Ukraine will go on after 2019," says Ukrainian energy expert Valentin Zemlyansky. "The question is in what volumes." Other experts say that Gazprom also has obligations to Europe on supplying gas through Ukrainian territory. Some of Gazprom’s contracts concerning gas supplies via Ukraine expire far beyond 2020, up to 2037. The centrist newspaper Nezavisimaya Gazeta previews the meeting between Indian Prime Minister Narendra Modi and Pakistani Prime Minister Nawaz Sharif, due to take place during the upcoming Shanghai Cooperation Organization (SCO) summit in the Russian city of Ufa (830 miles east of Moscow). Both countries are on track to become members of the organization, most likely in 2016. The meeting on July 10 between the two leaders may also help reduce tensions between the countries, which have recently increased because of the skirmishes on the demarcation line in the disputed Kashmir region. Sergei Lunev, a professor at the Moscow State Institute of International Relations, noted that the SCO members have different approaches: "The Chinese are interested in the economic component, which is why they have agreed to accept India. Russia had actively supported India, while China wanted to include India and Pakistan simultaneously. India did not agree, saying that Pakistan is a terrorist state," he said. India occupies an important place in Silk Road, the ambitious economic project promoted by Chinese President Xi Jinping. Russia, however, is mainly interested in the security aspect. According to Nezavisimaya Gazeta, this raises doubts about the efficiency of the organization. "In conditions in which the contradictions between Russia and the West have intensified, it is important for Russia to demonstrate that it is strengthening its positions in Asia," explains Lunev. "For Russia's image the expansion of the SCO is advantageous." The business magazine Expert writes that the emergency EU summit held on July 7 to find a way out of the Greek crisis did not yield any fruit. Europe blames Greece for the breakdown in dialogue, more precisely Greek Prime Minister Alexis Tsipras and the July 5 referendum on whether to accept the conditions set out for Athens by international creditors over repayment of its debts. However, Europe also carries a substantial part of the blame. European leaders themselves say that they are ready for various developments in the events. "The European Commission is beginning to consider the scenario of Greece leaving the eurozone," the publication cites President of the European Commission Jean-Claude Juncker as saying. The latest date for reaching a compromise is now July 12, the day on which the EU will hold another emergency summit on Greece. Despite convincing victory in the referendum and the EU's attempts to remove the Greek government, Prime Minister Alexis Tsipras is demonstrating his readiness to find a mutually acceptable compromise with the EU. As a sign of goodwill on the part of the Greek cabinet, Yanis Varoufakis has resigned from the post of finance minister, in which he held a hard and uncompromising position during negotiations with Greece’s international creditors. Apparently, Athens is preparing a transitory agreement that will allow it to escape default until the end of July. Expert magazine underlines that Europe does not have a unanimous position on Greece. German Chancellor Angela Merkel is taking an extremely tough stance: The Greeks must agree to reduce their economy, accept the creditors' conditions and pay their debts. French President Francois Hollande has expressed approximately the same viewpoint. However, other EU country leaders are voicing more constructive proposals, insinuating certain concessions. For example, Austrian Chancellor Werner Faymann does not exclude the possibility of giving Greece temporary financial aid, while Irish Finance Minister Michael Noonan has even suggested that eurozone finance ministers consider the restructuring of Greece's debt.